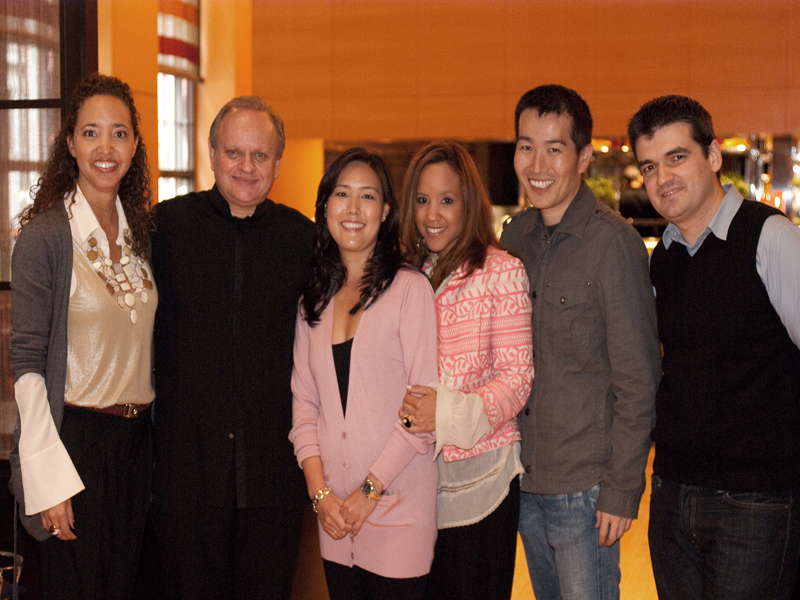 Joël Robuchon & I Chat & Cook in His NY L’Atelier! If you’re wondering why it’s been shy of 4 weeks of not blogging, it’s because I’ve been on a whirlwind of trips, galavanting as a true gourmand in NYC, DC and Mexico; and landing new major writing gigs. 3 weeks of back to back plane hopping, will take a toll on you and leave little room to sit and gather all your thoughts, let alone process pictures and recap notes. The most exciting of these trips happened 2 weeks ago in NYC. I’m still pinching myself. I’m floating on what seems to be the fluffliest cloud, only it’s edible. Perhaps something similar to the perfectly whipped foam Joël Robuchon made for lunch two Friday’s ago. Foam I ate right in front of him. A tease yes, as I’ll leave that story as a follow-up. I spent 4 amazing days in Manhattan, doing what any chef, young or old, would love to do more than anything else: Spend a personal and delicious afternoon with Joël Robuchon, “Chef of the Century,” in his NY Atelier. I’d been working on landing this one-on-one tryst for a few months and finally got the okay. He’s not the most accessible man, given his international celebrity and posture. I packed my bags, flew to DC for a day and then off to NY. Assistants and videographer in tow, I planted myself at the Kimberly Hotel, a few blocks away from the Four Seasons Hotel, home of his world reknowned restaurant. I invited the fun and talented Zen Chef to accompany me to this once in a life time meeting. Truthfully, my French is rusty, so I needed a translator. He agreed and the prepping began. I was advised Mr. Robuchon might not be interested or in the mood for anything more than a formal Q and A. I mentally prepared for that, but hoped for more. After all, my in-kitchen experience in his restaurant in Monaco left me wanting more. So, I arrived at his restaurant 45 minutes early the day of our meeting, anxiously hoping to get a feel for his energy before we met. As soon as I saw him, I smiled and introduced myself as the journalist that was going to interview him. He quickly and very casually greeted me with the traditional two-cheek kiss. At 1:55, Mr. Robuchon comes to my nervous team of 5 (videographer, 2 assistants, translator and photographer) and tells me he’s “ready.” I gather my head, click my Gwen Stefani heels, and enter what is about to become the most important interview of my career. 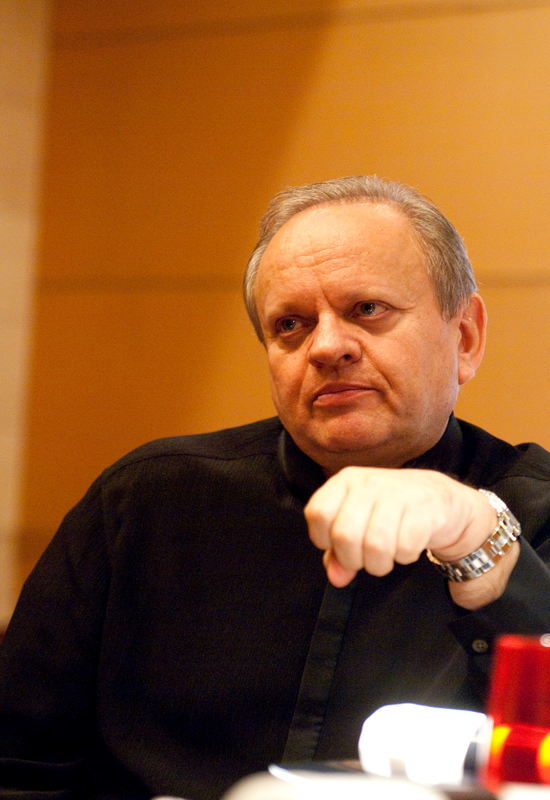 Joël Robuchon is the genius behind 18 restaurants worldwide, boasting 25 Michelin Stars, single handedly more than any other chef in the world. One of his most recent concepts, Yoshi, located inside Hotel Metropole in Monte Carlo, Monaco, quickly received one Star within 30 days of opening. I’ve yet to post on that visit, but trust me that it’s the epitome of East meets West cuisine. He has been named “Chef of the Century,” a title not easily acquired, but definitely an award well deserved if you consider his commitment, study, passion and art behind his cuisine and brand. 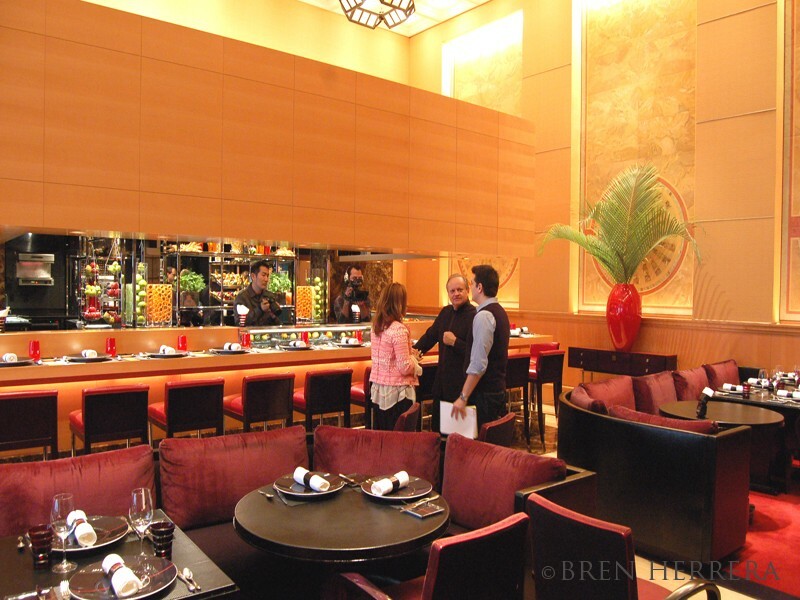 I entered the red and black zen-like decorated dining room, ready to get into my first few questions, when Mr. Robuchon cuts to the chase and asks me what I do. “Well, I’m a private chef and food/travel writer,” I say. “Oh la la. What kind of food?” I was very quick to say Cuban cuisine to which he grinned from ear to ear telling me he’s curious. Yes, curious. He’s never had Cuban food! Before I could get into my profession, he wanted to know what my specialty is and what my clients love most. I mention peppered oxtail cooked in red wine and tomato sauce. I explained that Cuban food is very much a delicious combination of French, Spanish and African cuisines. I mention my dedication to using the pressure cooker and how it expedites cooking time without sacrificing taste or nutrition. “Bren, you are so passionate about food, why don’t you have your own restaurant?” You know that old finger gesture suggesting money? Yeah, I did that, which prompted the most unexpected of responses: “Well, you come up with the concept and I’ll come up with the money!” Say no more Mr. Robuchon–jestful or not, I have on camera, the man offering something that would change the eating world! The energy between us at this point is very laid back, completely unassuming and super friendly (borderline affectionate), yet focused. Zen Chef followed my line of questions and allowed me to understand Mr. Robuchon’s answers on my own. I had a strategy on how the interview would go. But I’m dealing with the most influential chef of our time, so you can imagine I surrendered and let him lead. Still not sure if I was going to do the cooking demo I requested, I entertained him a while longer on my visits with his executive chefs back in Monte Carlo. He tells me that Chef Takeo Yamakazi (exec at Yoshi) demonstrated true skill, respect and art for Japanese cuisine and he wanted to incorporate that into his brand. In a very eloquent manner, he delves into his love for Japanese culture and aesthetic, something very reminiscent in most of his restaurants. Before I could nudge him into his own kitchen, he invites me to see it. If you’ve not been to any of his restaurants, the set design is transparent. The diner is supposed to see, feel and experience everything the cooking crew does while sitting at the Chef’s bar. I’ve never seen such an impeccably clean kitchen. So clean, you can lick the counter tops. But that wouldn’t be so cute. To my surprise, Mr. Robuchon and his intently directed staff, a combination of life long partners and younger chefs, had set out a demo for us to do! 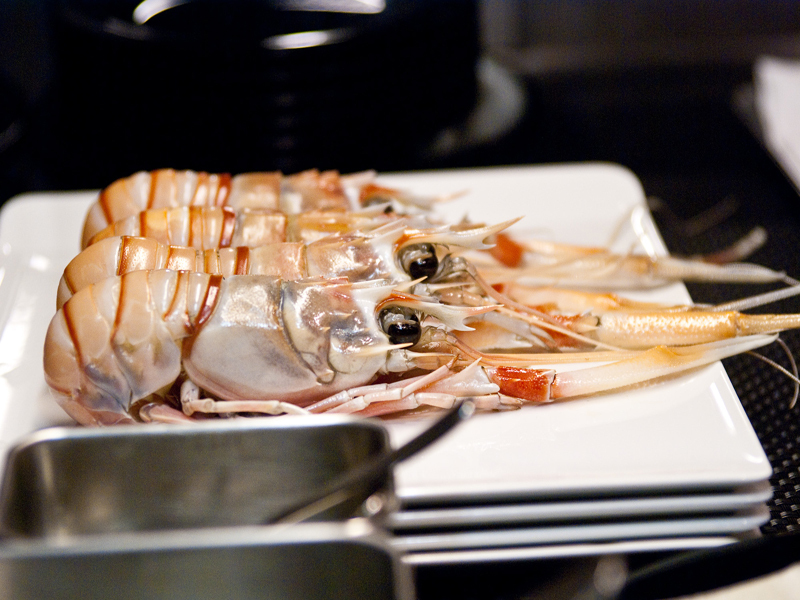 I instantly recognized it–fresh langoustine –to be deep fried in grapeseed oil and dipped in a very light basil sauce. Anyone else would be highly intimidated by being in Robuchon’s kitchen, knowing they were going to prepare something together; but I was excited and ready to take it all on! His warm and affectionate demeanor made me very comfortable. Because I told him I’d done that same dish with Chef Cussac, month’s prior, he asserts I should know the recipe and instructs me to make it myself! I was put on the spot. Clearly the amount of adrenaline was so rev’d up, I attacked that langoustine as if I’d done it over and over again. Unlike a young chef lacking the fine hand of detail and micro-attention, Robuchon leaned over and delicately sprinkled his langoustine with salt and chili pepper. I on the other hand, seasoned mine in a loose way, somewhat unmeticulously and full of zest. The langoustine is then topped with a crisp basil leaf. “Bren, how would you turn this recipe into a Cuban one?” he asked. “Well, first I would marinade the langoustine in a garlic mojo and instead of chili pepper, I would have sprinkled cumin on it. I would still use the basil.” Another “oh la la.” At this point, Robuchon is pleased with how I rolled the langoustine in the thin filo paper, which was closed by diagonally piercing it with a toothpick. Over at the deep fryer, I’m told the grapeseed must be at 350 degrees F and the langoustine fried only for a few seconds, until a pretty golden color. As I prepare to plate him the langoustine, I seriously say “I hear you like little dots so I’m going to make them for you, Mr. Robuchon!” Laughing an seemingly appreciating my knowledge of his particularity for dots, he made me the giddiest woman by reiterating ‘a partnership’ in opening up a Cuban restaurant. 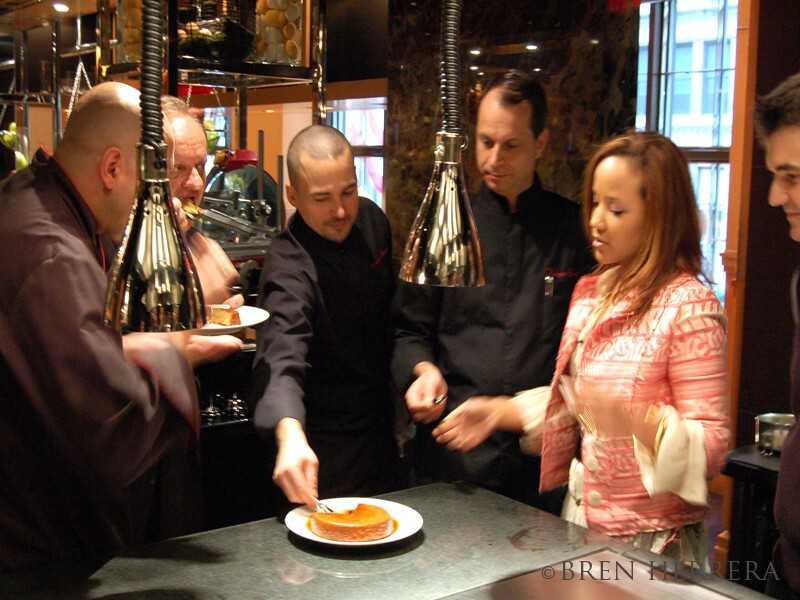 Before we left the kitchen, I surprised Mr. Robuchon with a flan. Hailing all the way from D.C. with me, I pulled out my dessert. 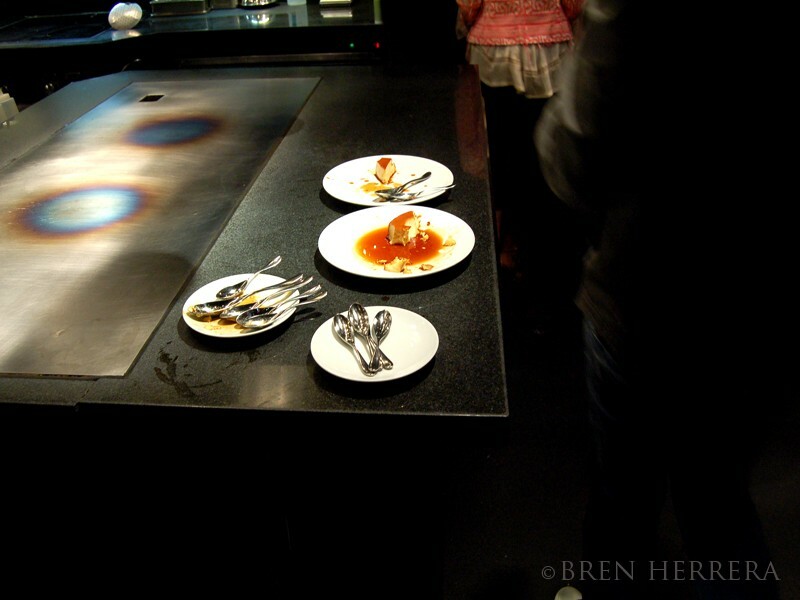 His team of 6 or so chefs and my team of 5, anxiously watched me unmold the flan, hoping it would not disgrace me in front of someone that could verbally bash my brand (as he’d done recently to a contestant on Bravo’s Top Chef). As I flip the flan onto a crisp white plate, the expression on his face was golden and nothing I could have ever paid for. Totally priceless. He goes for his spoon and digs in. A huge sigh of relief on Team B’s part. I think an even bigger sigh of relief on Robuchon’s team members. After all, I had not clued them in to having him taste something from a complete stranger. 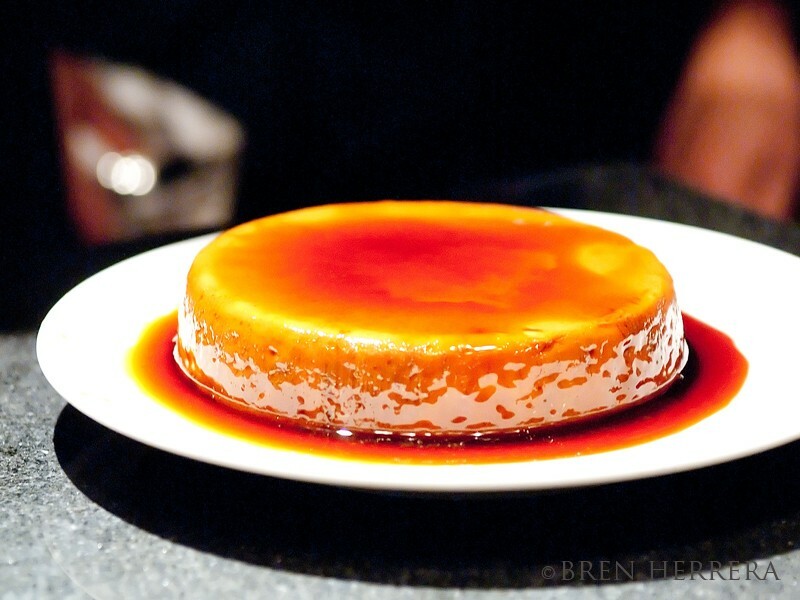 Not only did Mr. Robuchon smile and tell me it was “trés bonne,” he complimented me on the smoothness, caramel color, the fact that the flan didn’t have any wholes in it and that it was perfectly creamy. The man is a true master of food as an art. His spirit is food and it shows. We went back to the Chef’s bar where I asked his opinion on young chefs and the new wave culture of fusion foods. He was very adamant about that stating “I’m 200% against molecular gastronomy.” He is very clear to explain that food is to be respected at all times. “It had life at one point. Whether a fruit, fish or vegetable, it’s all life.” I think that’s something we could adhere to, helping us become better cooks, chefs and students of food. With a very modest and humble smile he says it was something media gave him but acknowledges other world reknowned chefs with a deserving accolade. He cheerfully mentions having received an email earlier that morning announcing his L’Atelier in Hong Kong had just been named number 1 in all of Asia. And I’m sitting next to him, just as casual as ever. Phillipe, whom I’ve taking a liking to because he’s fluent in Spanish though being an authentic French man, brings us a plate of fresh porcini. 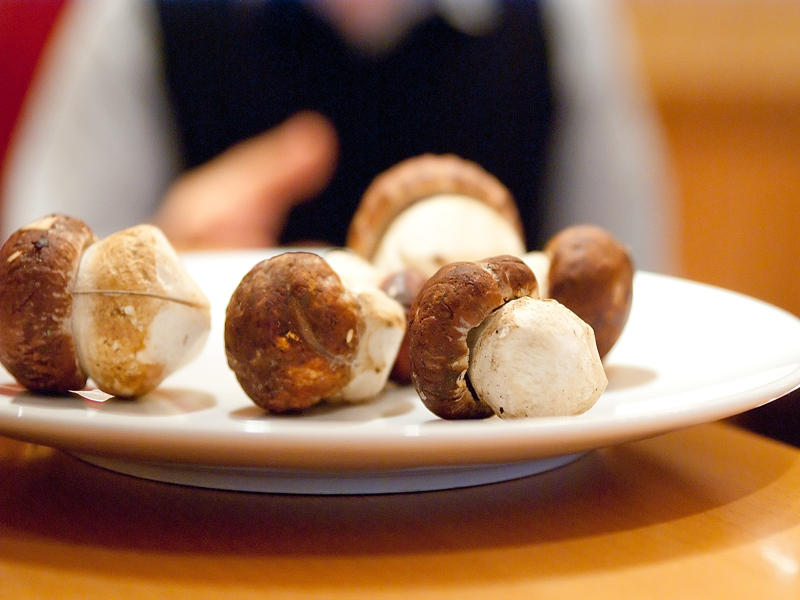 That prompts me to inquire on his business practices: What does he look for, what’s in and hot right now in ingredients, how does he choose his chefs, etc… The porcini had just been flown in from the other side of the world. As we hold it, he describes it in detail, telling me he looks for freshness, color, and the conditions they were grown in. Having been to and demo’d in two of his restaurants in Monte Carlo, I wanted to know about his new brand and aesthetic approach. After closing his famous restaurant in Paris in 1996, the city shook. He explains he was suffocating and trapped in his own celebrity. “At that point, I’d not traveled much. I didn’t know other food or cultures, but wanted to. My partners urged me to look at my brand and reinvent myself.” Now, he’s much more about the art of food and cooking and openness to his diners than he is about the famous chef and classical French cuisine. He’s enjoying himself and all the traveling he’s doing. He’s on top of his game. I can’t tell you how special the visit with Mr. Robuchon and his crew was. He was ultra generous with his time, space and energy. I was never rushed, or felt like we were imposing, cameras and all! In 2 hours, I learned more about him, than his beautiful white cookbook will indulge. I felt inspired to implement some of the philosophies he employs in his international empire. 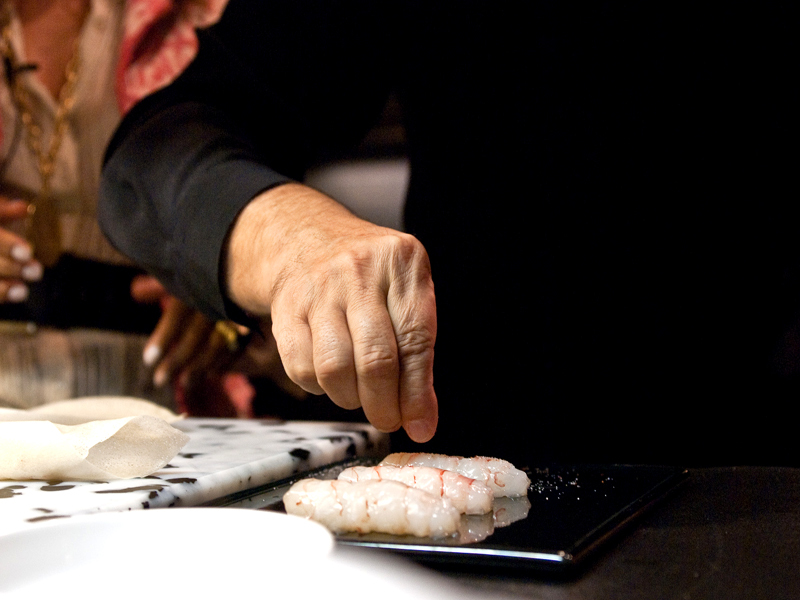 Simply put, to become a better chef and reach for the best. I might even take him up on his offer to open up a Cuban restaurant–he suggests we do it in Havana. He speaks with complete confidence and passion about what he dishes out. Notwithstanding a few self-imposed setbacks, he is better than before. He’s seeing the world and offering a bit of it to those of us that can’t see it, through the ambiance and food served at his Ateliers. And as if the afternoon with him, sans visitors, other diners, etc… wasn’t enough, Mr. Robuchon invited me to come back that Friday for a private media luncheon. I agreed and stayed in NY for a few more days just to sit at that bar and be served by him. That story, my friends will be in another post. Huge thanks to the entire PR and Atelier staff at The Four Seasons for allowing me to do this. They were most kind and helpful in making this go smoothly. Master chef Phillipe Braun for treating me like family, for real (on my right, above). Another thanks to Village Tea Co., an amazing loose leaf tea boutique out of Dallas for their sponsorship and support in making the trip a huge success! Do visit them! Major thanks to Zen Chef for helping me with the interview, ensuring our conversation was properly interpreted. 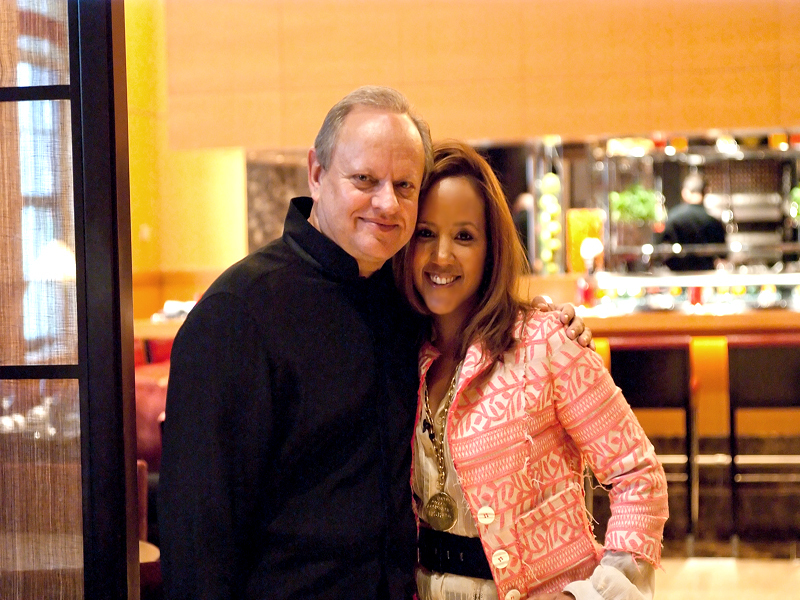 I really couldn’t have done it without him; otherwise Mr. Robuchon would have been speaking broken Spanish (which he does) and I broken French–and who knows what would have come out of that! Thanks to Marc of No Recipes for taking some awesome pictures, a lot of which are in this post. My good friend Michelle for coming from DC to help me keep my schedule in order, taking pictures also in this post, making sure all releases were signed, etc…Dana, the blog winner of the “day assistant” job. This food enthusiast was an amazing asset, always being on time and having my paper work on hand and dressing me in her most beautiful jewelry!! Oh and yes, keeping me from totally losing my composure as I flipped that flan! And of course Robbie, my relentless videographer whom captured 4 days of eating my way through NY, most importantly the tryst at L’Atelier de Joël Robuchon. Stay tuned for a full video episode of the experience and demo which will air here on the blog and on “Daytime,” later this fall. The full interview will be published in two local Atlanta magazines and hopefully one other major national hitter! And of course, Mr. Robuchon, for inviting me and my friends into your space during closed hours, for letting me cook something in your kitchen, for being so generous and courteous, for the personal invitation to all of your restaurants worldwide, for inspiring me, and lastly for eating and loving my flan and then telling my dad about it! This girl here is lovin’ it! Joël Robuchon has endorsed my flan.